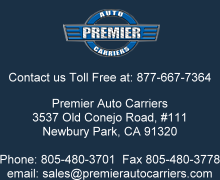 It is important to remember that at Premier Auto Carriers we own and operate only fully enclosed transport equipment. This insures the highest level of safety and security for your automobile. Our fleet of state of the art well maintained tractor trailers are specifically designed to transport between 6-7 vehicles per trailer. We incorporate both lift-gate style and ramp style trailers in order to accommodate the diverse needs of our customers. Our drivers are knowledgeable in the safe operation of even the most unique automobiles which really speaks to their level of experience and adds a professional touch. Whether you desire to move 1 car or an entire collection, across the street or across the nation, Premier Auto Carriers is well equipped to handle your transportation needs. Our commitment to quality begins even before we load your vehicle. Our drivers place seat covers and floor mats in your car in order to protect the interior and keep it clean. Then we perform a very thorough and detailed inspection of your vehicle to insure that when we deliver the car, it is in exactly the same condition as when we loaded it. 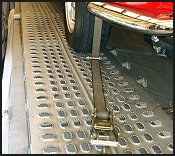 The vehicle is then loaded onto our enclosed transporter and safely secured with a nylon "soft-tie" securing system that prevents any damage to the undercarriage or suspension of the vehicle. 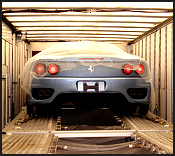 This is the most important aspect of the transport process because it insures that your vehicle is properly secured. 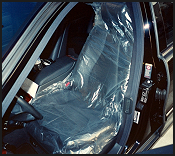 Our drivers then take extra care by covering the vehicle with plastic or cloth covers for additional protection.